It’s been an eventful few weeks in the world of folk music. Bob Dylan, the singer-songwriter who seemingly created the soundtrack for the civil rights and anti-war movements of the 60’s counterculture, was honored with the Presidential Medal of Freedom. His musical career has spanned five decades, during which time his lyrical poetry has become a cultural legacy. Critics and fans alike can at least agree that his songs are a literary journey through recent American history. On a less positive note, Doc Watson, the bluegrass legend from Southern Appalachia, known for his smooth banjo picking and humble manner, passed away at the age of 89. Though his deep voice and graceful musical style will be sorely missed, his influence echoes through the valleys and hollows of Appalachia and beyond. Not only did he push the boundaries of traditional bluegrass with his flashy flatpicking on guitar and banjo, but he also dug deep into the oral traditions of Southern Appalachia and melded its stories into beautiful mountain ballads that spoke of a culture found in the mountains around his Western North Carolina home. The thread that weaves these two men together is not just their musical prowess but also the art they both eloquently mastered – storytelling. Here at CLiF we have quite a reverence for the act and influence of storytelling. Each program we offer kicks off with an event where a presenter, often Duncan McDougall, visits a school, community center, or other central location. Against a backdrop of tables smothered in crisp new books, he whisks the children away to new lands and imaginary worlds. Much like Bob Dylan’s music pulls us back to a time of war protests and political strife and Doc’s deep voice lulls us to the shady groves of the Appalachian mountains, Duncan’s stories engage all senses, excite the imagination, and leave the listener yearning for another journey through words. Storytelling takes many forms, and whatever the medium, its power lies in its ability to encompass the listener with sensory detail and evoke emotion beyond its words. Whether through journaling, poetry, fiction, music, or art, we all have a medium that suits us. 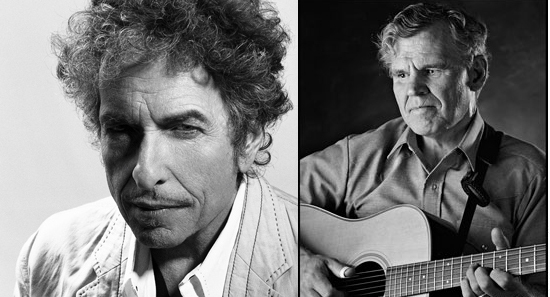 Bob Dylan and Doc Watson have both made music whose influence continues to ripple, while Duncan’s storytelling inspires children to pick up books of their own and take themselves on an imaginary journey. How do you tell your stories?